Home > News > It’s Grim Down South! Tower strengthening in the South of England in conditions that we’re more accustomed to nearer home! The work involved replacing diagonal members and the installation of face frames with steelwork fabricated in house. 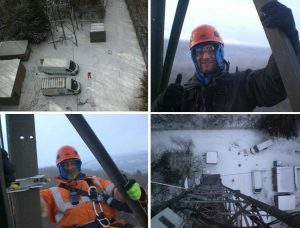 All work was completed on time despite the challenging conditions and appalling weather.